A new day for everyone in the forest no matter what forever. No matter how much anybody (me, trees, the sun, grass, angry hawks, scheming squirrels, forceful ants) tries to halt the forest, it keeps going. It is quite daunting to consider. The forest will keep moving even when you need a break. Even if the last thing you want is for the forest to continue its neverending, unceasing, cyclical grind, the forest will not mind you. It will persist with or without you. With the forest’s attitude toward pushing onward and upward indefinitely, it is very easy to feel left behind or even swept aside by the forest. I often look at where I am and where I have been and ask myself why I feel lost or disconnected from everything in the forest. What have I done wrong? What have I missed? Why does everything press on without me? Does the forest not like bears? Does it reject bearness? Do I have a smell about me the forest does not enjoy? The good thing is that these feelings are overshadowed by the massive possibilities that come with the neverending forest. Yes, the forest moves on no matter what, but so can you, or any other creature in the forest. 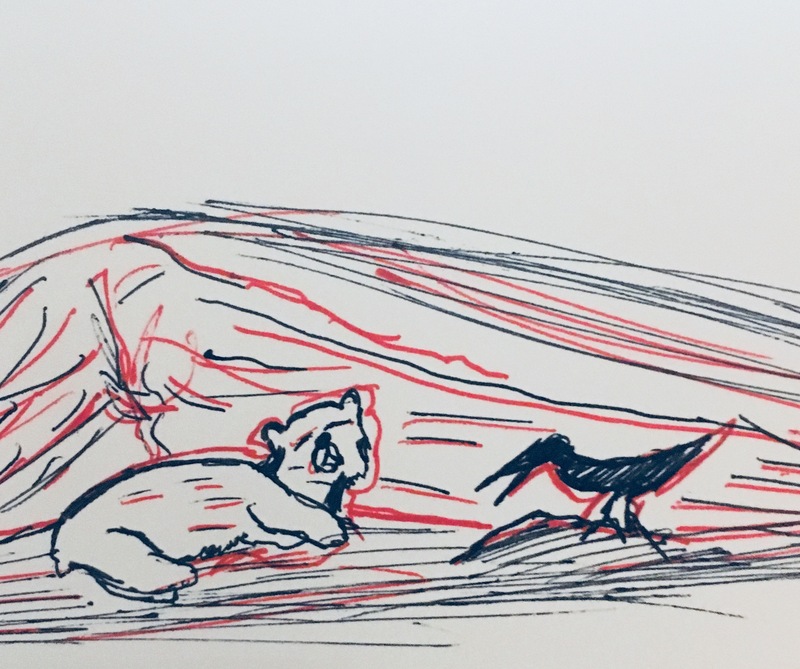 Even when you feel completely removed from the forest’s ongoing trajectory of chaos, it is surprisingly easy and simple to rejoin or, at least, go forward in your own manner (for me this means progressing my bearness, however I might interpret that). The forest’s seemingly apathetic view toward your own pursuits can be played to your benefit. Just as the forest does not seem to care enough to wait for you when you are down, it also does not seem to mind when you rejoin and get back on your path. It is actually quite easy join the forest’s ongoing goingness, regardless oh how long you have been unable to do your own goingness. I hope, like the forest, I can keep going. I hope it leads to me understanding my bearness and the -ness of those around me. And then I hope I get to keep going. This entry was posted in Bear thoughts and tagged @a_single_bear, bears, humor, keep going, nature, new year, the forest, twitter on December 31, 2017 by A bear. My donations to the forest. I recently decided that an unfortunate-accidental-sleepover-incident involving a raccoon and the fur on my back had a wonderful silver lining: I was able to donate a few tufts of fur from my back that were ripped asunder by an alarmed raccoon to the forest. I left the little balls of hair on the forest floor with the hopes of some fur-needing creature wandering by and happening upon them. It was a nice feeling. Not only did it distract me from the pain of my back, but it also led me to thinking of different ways I could donate things to the forest and creatures who were in need. In that spirit, I started to leave little things around the forest I no longer had any need for. My claw tips. My left over leaves. Some acorns I found in my cave. One of my rabbit skeletons (an old one I never really licked anymore). A branch I could not eat all of. Some plastic bags that got stuck on my head for a full day (I was happy to get rid of them). I kept giving and giving, and it felt great. I no longer had the burden of these possessions nagging my thoughts, and, with any luck, some creature who needed these things would find them, get their use out of them as well, and, maybe, pass them on to other creatures. I started to think about how much of the forest I experienced is a donation from other things, too. The trees lend me their leaves. The sun gives me its light. The rabbits leave behind their skeletons. I borrowed all of these things, and there was no need to keep them in tiny piles in my cave forever like I usually did. They had a greater purpose that could not be fulfilled while they sat in my cave, doing nothing. The forest seemed to thrive off this uplifting cycle of borrowing and lending and donating and accepting. It was a nice realization. I hope that I am able to give more of what I can give as I keep going throughout the forest. Who knows, maybe one day some creature will collect my bear skeleton and get some kind of use from it. I hope that is not for awhile, but it is a nice thought. This entry was posted in Bear thoughts and tagged @a_single_bear, bears, humor, nature, trees, twitter on December 18, 2017 by A bear. I hope nothing scared you today (or other days). Being scared is a constant experience in the forest. There so many scary things. Sudden loud sounds. Violent insects. Squirrels (in general). Accidentally breaking things. The possibility of squirrels organizing and planning things. Fish eyes (very scary). Sometimes, it feels as though there is no escape from all the awful scary things in the forest. Even when I am alone in my cave, resting or napping or sleeping, I can experience being scared. Sometimes my mind wanders to scary places without my permission, bringing terrifying ideas and images to me that I did not ask for. So even within my bear mind, outside of the context of the forest, scariness is right there, waiting to make me feel upset and uncomfortable and unstable. It is difficult, and it is something I hope you have not had to experience, at least not today. You being a creature of the wherever you are from (I assume the forest, just a different part of it) surely have experiences with being scared. I am certain that you have faced scary things. I am certain that you have even overcome and fought off scary things. Maybe you have even been a scary thing to some other creature (I know this can happen by accident quite easily (sorry, opossum I sat on in the dumpster)). But should you find yourself scared, I do hope you know a few important things about the feeling. It is, for example, quite temporary. No matter what strange forest thing is haunting your mind or body, being scared will eventually go away. It is a short lasting feeling that you will most certainly defeat and move away from with time. And of course, it is important to know that you are never the only one who is scared. Most things are always scared a lot of the time, and things that do not seem scared are just very good at hiding it (even rocks probably get scared (maybe (I have not tested this theory)). And even knowing that you are not alone should help conquer your being scared. I hope nothing scared you today or any other day, but if you did get scared, it is okay. I promise. This entry was posted in Bear thoughts and tagged @a_single_bear, bears, being scared, humor, nature, scared, scary things, the forest, twitter on December 11, 2017 by A bear. The magical fox who was not a fox but was actually plastic. I recently spent quite a bit of time discussing many important topics with a very magical looking fox. I found the fox near a human cave, sitting on the human’s trimmed grass (why do humans trim grass when it is so neat and perfect as it is?) and staring off into space. The fox had what looked like some kind of fancy hat resting on its fuzzy head. Its whole body sparkled in the air, drawing my attention. It lit up its immediate space. It was magical. I approached the fox cautiously. Most foxes run when they are approached no matter how cautious or friendly you might try to be toward them, but this fox was firmly staying where it was. I took that as a cue to continue approaching the fox. When I got face-to-face with the creature, I was mesmerized by how inviting it seemed. It stared at me as I stared back, emitting an aura of pleasantness that made me feel comfortable and fulfilled. So I shared with the magical fox. I shared my concerns about being a bear and how bearness is part of the forest and how the forest is part of bearness. I confessed how I was afraid of the plans of squirrels and how belittled I felt when I saw the deer across the river. I explained to this magical little fox that I sometimes felt like one tiny, insignificant piece of the complex organism that was the forest, and that my piece of that organism was not entirely needed and even, at times, unwanted. Eventually, I felt like I was doing too much of the sharing, so I asked the magical fox to share. The fox stared at me some more as I eagerly waited for its perspective of the forest. I did not want to intrude this magical creature’s personal space, but I did not know what to do, so I pushed my nose against the fox’s nose. And it stung me! It was sharp and strangely pointy and not fuzzy at all. Further investigation led me to realize this magical fox was not a fox it all. It was a magical chunk of plastic and sharp things. Once I realized this, I did what I do with just about all plastic things I find: I chewed on it. It tasted very sharp. And it hurt. And it shocked me. I placed far too much trust into the magical fox who was actually a piece of sharp, shocking plastic. I am happy I did, though. Even if nothing heard my woes and thoughts and feelings, it felt good sharing them. This entry was posted in Bear thoughts and tagged @a_single_bear, bears, forest, fox, foxes, humor, nature, the forest, twitter on December 4, 2017 by A bear. I destroyed some very good leaves. I recently found a bundle of absolutely terrific leaves just sitting about the forest floor. I stared at them for awhile, admiring how perfectly crinkly and brown and orange they seemed. After taking in their lovely aesthetic, I rolled around in them, as I have done with many leaves I have seen for as long as I can remember. This has been a routine, normal thing for me to do for a very long time, and before now, I had never put much thought into it beyond the simple pleasures it had brought me. It was almost as if I had always assumed leaves were there for me to roll around in. Now, I am not quite sure the truth is anywhere near that. After the last time I rolled around in perfectly crinkly leaves, I took a moment to look upon the destruction I had unleashed onto them. They were completely destroyed, dilapidated, decimated. Ripped asunder by my careless rolling. My want for the crunch of their tiny leaf selves beneath my not-very-tiny bear body overshadowed my ability to consider what they were being put through. I had ended so many leaves just because I liked to roll around on them. The mangled leaves got me thinking about how often I must ignore the results of me pursuing my interests and wants. How often do I do something for me, all the while ignoring how everything else in the forest is affected? When I break a branch on a tree while climbing it, I focus on the hurt I feel when I hit the ground, but what about the tree? Does the tree not also feel hurt with a once perfectly good branch ripped from itself? Does the water in the river have any interest going into my mouth and through my bear body? I have certainly never asked it. When I thought about how my actions affect everything in the forest, I started to realize that most of my forest interactions are positive for me and horribly negative for the other party. Of course, some are unavoidable. Sorry, river water, but I need to drink you and you show no protest against it. But do I need to roll around on leaves? Of course not. I do not know where to begin when it comes to making sure there is a balance between my actions and ensuring their positive affects on others, but maybe it begins with being more aware I am not the only creature, the only thing, the only being in the forest. I am one, single bear among many other creatures and such, and understanding my own bearness certainly must involve knowing how it affects those others. This entry was posted in Bear thoughts and tagged @a_single_bear, actions, affects, bears, humor, nature, trees, twitter on November 20, 2017 by A bear. It is easy to get lost. Of course, there is the normal getting lost way of getting lost. The kind that involves losing track of which trees I have smelled before and which rocks are the exact lumpy ones I usually use to find my cave. This kind of getting lost happens frequently, and when it does I usually stare off into the distance of trees and leaves that make up the forest background, and I wonder where to go. This kind of getting lost is easier to handle than other kinds of getting lost. As I wonder where to go, I raise my snout into the air, get a good whiff of something interesting, and then I am no longer lost. I am then pursuing something new, something interesting. Sometimes I get to that feeling lost moment, the one where I am staring out into the forest, and I actually know where I am, I am not physically lost, but I am still not sure where to go or why I would go there. In those moments, I just stare and wonder where I should go, but no smell nor sight nor sound will budge me. I do not wonder where to go. I simply do not know where to go, and even when I think of somewhere to go, I convince myself that there is no real reason to go there. In those moments, I do not know where to go even though I know exactly where I am and where I normally go. Those moments make me feel very stuck. More stuck than anything has ever made me feel stuck. I once put my head through a broken fence to reach the bottom of a dumpster leaking what looked like a very wonderful sauce, and when I tried to retrieve my head, the fence held onto it and refused to let go, and that level of being stuck is still nowhere near how stuck I feel when I do not know where to go. It feels everlasting, and it feels very bleak and empty and hopeless. I recover from it eventually, of course. I get my thoughts back in my head and I remember where I need to go, in some capacity, but in the moment of not knowing, I am quite scared. Maybe it is about purpose? Maybe in those moments I need to remember why I am a bear, all the reasons I might have for continuing to be a bear. Of course, that presents a whole different set of problems that I have never been able to overcome. Maybe it is about that interesting smell? Maybe in those moments I should ignore the blankness and hopelessness and just go toward that interesting smell, even if it is not really there. At least then, I have an idea of where to go. This entry was posted in Bear thoughts and tagged @a_single_bear, bears, getting lost, humor, lost, nature, the forest, trees, twitter, where to go on November 13, 2017 by A bear. I hope you get to feel okay. Being is usually quite nice, especially when partaking in some of the nicer aspects of being (eating, napping, seeing colorful rocks, swimming without getting a whole lot of water in my mouth, finding a very new rabbit skeleton, not being eaten, getting to know a frog, realizing how many toes I have, discovering a new smell in a dumpster, running through a cluster of birds, eating, napping). It is fortunate that being gets to consist of so many pleasant things. But it is not always eating and napping and colorful rocks. Existing has a vast array of events and objects and bird sounds that are terrifying, upsetting, scary, and alarming. Even while enjoying the finer points of being, an upsetting thing about being can happen. Why did that crow shriek at me while I was enjoying my nap in my cave? There is really no way to know, but I do know that it was upsetting and I did not like it. I did not feel okay while it happened and for quite some time after it happened. Being, existing, is unpredictable. That is probably the hardest part about being in the forest. There is no way to tell when I will feel okay and when I feel not okay. There is no guide for knowing when everything will be okay or not okay. Good or bad things just seem to happen, adding to the chaos and unpredictability of the forest. Not only will I never know that a crow will yell at me, I will also have no idea when it will yell at me. Or why. Or even really how. It will just happen. And it did just happen. It is not easy. In fact, existing seems to be more scary than it usually actually is because there is no way to know when it will be okay and when it will not be okay. Because of the uncertainty, I tend to brace for the not okay of being, which can even make the okay things feels not as okay as they should. I want to hold onto feeling okay as much as I can, though, as difficult as it can be. I know there is a chance that a crow could always yell at me, but I do not want to feel not okay just because that is always a possibility. I want to feel as okay as I can as often as I can. I hope you, as a creature who probably is, probably exists, get to be okay today. I hope you do not feel the need to brace for the not okay of the forest, or the wherever you are (which is probably the forest), and I hope you can, instead, be okay while being the thing that you are. Everybody deserves to feel like they are not going to be yelled at by a crow, and I hope you get to have that. This entry was posted in Bear thoughts and tagged @a_single_bear, bear blog, bears, nature, the forest, tree, twitter on November 6, 2017 by A bear.